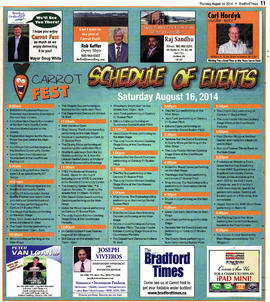 Three articles in the Aug 14, 2014 edition of the Bradford Times, all relating to Carrotfest events. 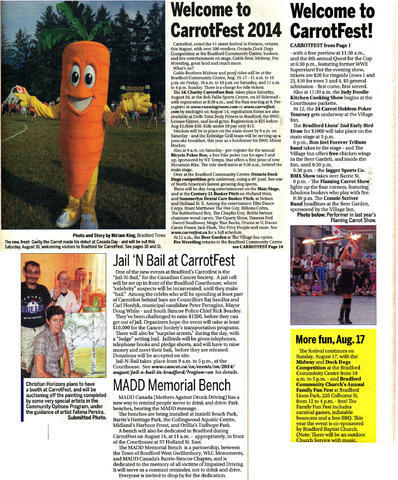 "CarrotFest, voted the #1 street festival in Ontario, returns this August, with over 300 vendors, Ontario Dock Dogs Competition at the Bradford Community Centre, buskers and live entertainment on stage, Gable Bros. Midway, Pro Wrestling, great food and much more. ..."